Already own a condo in Key Harbour? Thinking of selling? Click here and read about current search trends & our web network. 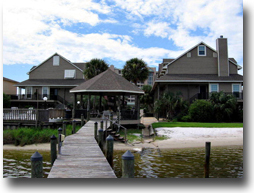 Key Harbour condos in Perdido Key, FL are a much smaller, low-density complex than most in the area. Situated to the East of state line, Key Harbour's proximity to various area attractions, is a very appealing trait. This low-density condominium is located on Old River; across the street from the Beach. The complex has a community pool, pier and 20 boat slips for Key Harbour owners and guests. The units have high ceilings, lots of windows and lots and lots of natural light. Beautiful natural light. The units have two bedrooms and a third floor bunk room which easily transitions in to an extra bedroom. The spacious balcony is great for outdoor entertaining. Please let us know if you would like further info for Key Harbour or any other condos, homes or real estate along the Gulf Coast or would like to schedule a private viewing by emailing info@condoinvestment.com or by calling (251) Area-Pro (251-273-2776) for immediate assistance.